With my friends leading busy lives, and my desperate want to try something new, it took countless failed attempts before I convinced one of my friends to journey with me to green park, to try a non-traditional dough waffles that have taken London by storm. Usually, this Cantonese snack is without topping, but this twist peaked my interest. Ten minutes walk from Green Park station, you can spot the caravan in an in-and-out space. Within the space, there is three other food on wheels that specialise in different cuisine. Walking towards the van, it was telltale that most people like me came from a long distance, along with their camera and friends. As we ordered our choice, the server immediately warned us about the thirty minutes wait, and we agreed, wishing, and hoping it will be worth it. As we waited, I couldn’t help but drool at other people choices, and anxiously tapped my feet in expectation of choice. Once we received our food, I felt like the world stopped, and all that ran through my mind was to capture that picturesque waffle, then devour the dessert. However, our expectation fell short, as we mulled over our thoughts on the dessert. With our food critic mind in full force, we compared the waffles we had in Wafflemeister and Fenton’s Ice Cream, drawing a conclusion that, although the waffle is lovely, the waiting time and journey to get the dessert isn’t worth it. 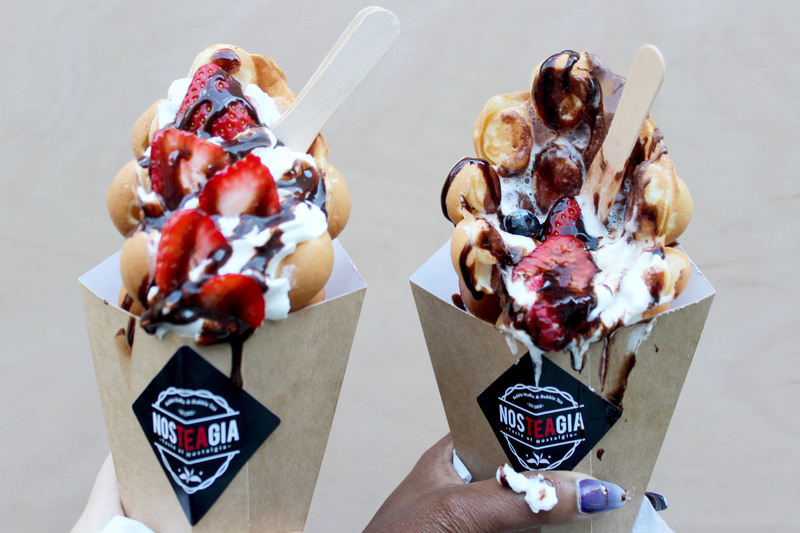 Nosteagia doesn’t possess the addictive and filling qualities as Wafflemeister and Fenton’s. Their dessert is just a snack you accidentally stumble upon when you’re out in London needing a quick bite.